I love a kitchen packed full of color. And this turquoise, green and purple kitchen does not disappoint in all that bold color, packed into such a small space. What I found so interesting with this kitchen, is the placement of the wallpaper. There is the standard paper above the cabinets. 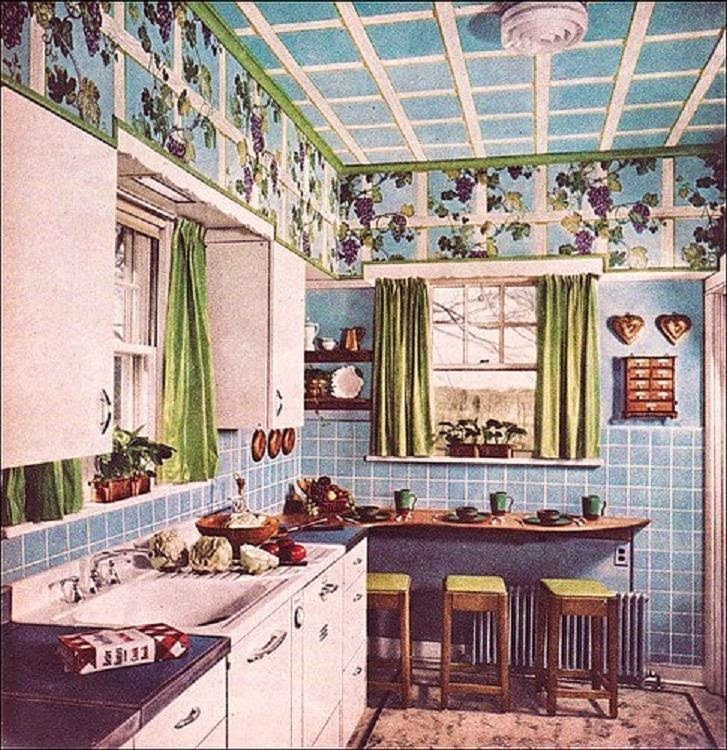 But the twist to this kitchen is the continuation of the arbor design paper. To the ceiling! So there is this illusion of the kitchen being under a sweet grapevine filled garden arbor. Love it! The wallpaper & curtains just are the 2 things I'd change. I love the rest of it! I had ordered about 15 or so BH&G magazines to my cousins & just picked them up - love the old ads & kitchens. Oooh! I love it! What month was this in? ~ Pyrex from the UK - gravy boats! ~ Vintage goodness.... colored bathroom tissue!